VoxTec is now taking orders for the Phraselator P2, an improved version of its original product. The new device is a complete redesign, with longer battery life, higher-fidelity audio, better speech recognition and improved ergonomics. The P2 works by accepting a spoken statement by the user; the speech recognition module translates the english language statement into its closest foreign language equivalent. The system has a modular design; CompactFlash (CF) or Secure Digital (SD) cards are used for phrase libraries with up to 30,000 phrases on each card. The ruggedized P2 runs WinCe on an Intel XScale PXA 255 Processor, has a day/night touch screen and amplified audio. The unit weighs less than one pound. 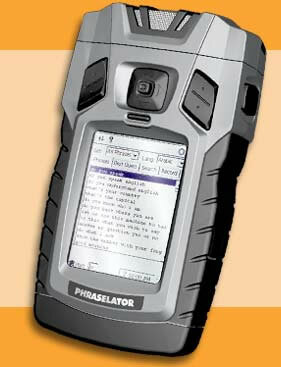 The Phraselator P2 is already in production; limited numbers of devices are currently in use in the Middle East. Speech recognition and translation are common problems in sf; see the ear-clip headsets from William Gibson's 1996 novel Idoru for a sample. For more information, read the Phraselator P2 FAQ.